Looking for some front shocks for the murena. The obvious way is to get koni or spax. Seems that bagheera shocks will fit murena? Same as simca 1100? About 90 pond for a pair. They are bit longer but thats not a problem and they work just fine. Never heard about JYB but for 90 pounds you could take a gamble. But the front suspension is pretty simple when it comes to shocks. I have never rated Monroe shocks. KYB on the other hand are usually pretty good. Surprised that they do Baggy or Murena shocks. Simca 1100 shocks will be set up for a big engine and gearbox at the front. Might be a bit unforgiving with a light load. KYB is kayaba. I remember this brand for motor cycle suspention, some years ago. The KYB 244029 is listed as bagheera front shocks, and opel shocks. 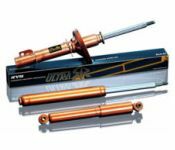 As KYB thinks that opel shocks are the same as bagheera shocks: let's look for opel shocks. Maybe the opel manta A shock from GAZ is suitable. GT5-2182. The gaz is adjustable, the kyb isn't. GAz GT5-2182 are about 55 pound each.